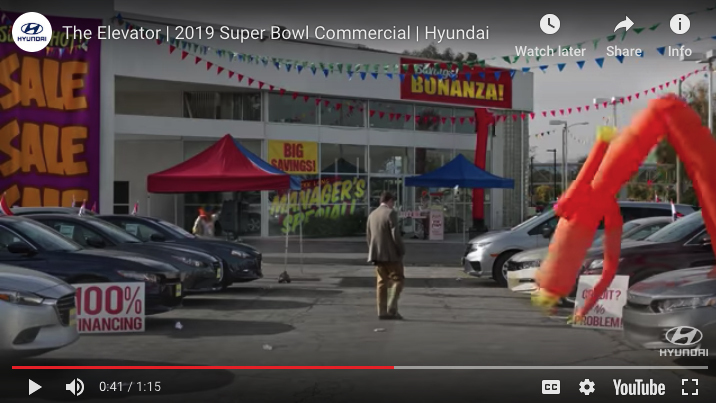 Did Anyone Notice that Hyundai Spent Millions on A Digital Retailing Ad During Super Bowl LIII? This year’s Super Bowl was honestly one that I think will be quickly forgotten. Yes, the Patriots tied the Steelers for most ever Lombardi Trophies. Yes, Bill Belichick became the oldest head coach to win a Super Bowl. Yes, Tom Brady cemented his place as the greatest QB of all time with 6 rings. But overall the game was fairly lack-luster. This was the first Super Bowl ever where there was not one touchdown scored through the first three quarters. The coaches made really no noticeable adjustments after the half. And the halftime show was mundane at best. All in all, it was a snore fest. However, one aspect of the Super Bowl that is always entertaining (at least in my opinion) is watching all of the big-budget commercials that run during the game. Super Bowl commercial viewing has become an event in and of itself. Many non-football fans tune into the game simply to be entertained by the world’s largest companies slugging it out over 30 second time slots to try to be the one that millions of customers will be talking about for the following week. This year the cost of a 30-second commercial slot was a record $5.25 million. That’s roughly $175,000 per second! What’s always been interesting to me is that The Super Bowl is a great barometer for what messaging the largest companies in the world believe will resonate most with their customers in 2019. It also gives us a great look into the products and services that these companies are betting on to spur their growth in the future. Looking into a few of the ads from this year’s Super Bowl you start to notice how a lot of these messages lean towards product transparency and ease of consumption. CBS joined the ranks of the top streaming services by promotion online-only content with the rebirth of The Twilight Zone (which also highlights the fact that more and more people are “cutting the cord” and getting rid of traditional cable). Along those same lines, we saw multiple spots from Netflix, Amazon Video, and Hulu promoting more of their own original content, leaning on how you can access high-quality television programming anywhere and anytime. On the product transparency front, Bud Light was clearly touting the fact that their beer is made without corn syrup, unlike their biggest competitors Miller and Coors (as if we’re now supposed to believe there’s a “healthy” option out of the three). And for just an added bit of shock value, we did get to see The Mountain from Game of Thrones crush the Bud Knight’s head like so many empty beer cans. Hyundai spent over 10 million dollars on a Digital Retailing ad!!! Midway through the 1st quarter, the game cut away to a commercial that opened with a couple walking onto an elevator. When the doors opened, we see Jason Bateman playing an apathetic elevator operator taking people down and down through life’s most annoying and uncomfortable events: getting a root canal, jury duty, getting stuck in the middle seat of an airplane, a father having “the talk” with his son, and a vegan dinner party. The last stop on the trip was “car buying,” suggesting that the experience of buying a car is more painful than all the others listed before it. When the doors opened on the “car buying” floor, we saw an empty car lot with balloons, wacky-wavy-inflatable-arm-flailing-tubemen, and a lone salesperson kicking rocks with not one car buyer in site. However, as Bateman tried to get our couple off the elevator and into “car buying hell”, our heroes stopped him in his tracks and showed him how they’re making their purchase using Hyundai’s Shopper Assurance tool. Without hesitation, Bateman shut the doors, reversed the elevator’s course, and took the shoppers all the way up to a clean, simple Hyundai showroom. When I saw this commercial, I did a bit of a double take. 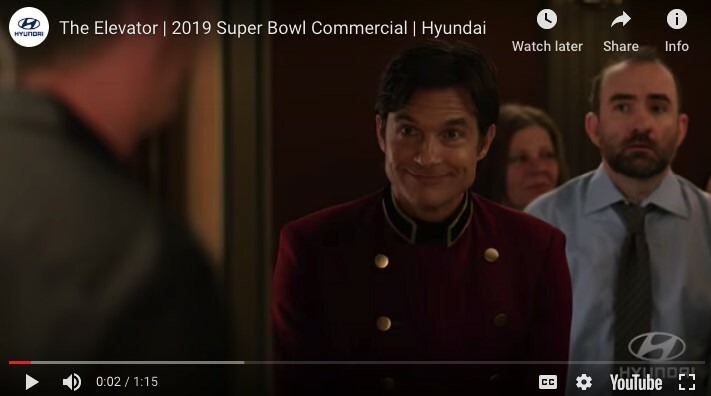 I thought about it for a few seconds and then asked myself, “Did Hyundai really just run a digital retailing ad in the middle of the Super Bowl?” Turns out that’s exactly what they did. Now truthfully, I had never heard of Shopper Assurance before, so my natural instinct was to go out to Hyundai’s site to learn more about it. I must not have been the only one because the site was having a very hard time loading, indicative of a massive influx of traffic. When the page finally did load, I navigated to Shopper Assurance to learn more about this new, simple way of buying a Hyundai. Shopper Assurance, as described by Hyundai, is a “digital retail tool [that] allows shoppers to pre-fill online their information including credit application, finance options, payment estimation, and trade-in information with the goal of drastically reducing the amount of time a shopper has to spend in a dealership.” Basically, this tool is designed to get the customer to a final price and payment online so that all they have to do is walk into the dealership and pick up their new Hyundai (shameless plug but that is exactly what Dealer eProcess’s digital retailing tool, SARA, does). And rather than promoting their product set and why Hyundai is better than all the rest, this manufacturer decided to spend a lofty amount of money showing consumers how the car buying process can be simplified through technology. Hyundai’s Shopper Assurance ad was a refreshing departure from what we’re used to seeing from car manufacturers. It shows that Hyundai is so much more focused on one of the biggest problems plaguing our industry; the fact that the car buying experience is so painful that shoppers view it as worse than having to eat beetloaf at a vegan dinner party. And the fact that Hyundai was willing to spend easily over 10 million dollars telling customers that using digital retailing as part of their process will make car buying a pleasant experience makes me think that more and more consumers are going to be looking for similar tools as they go online to shop for cars in 2019. 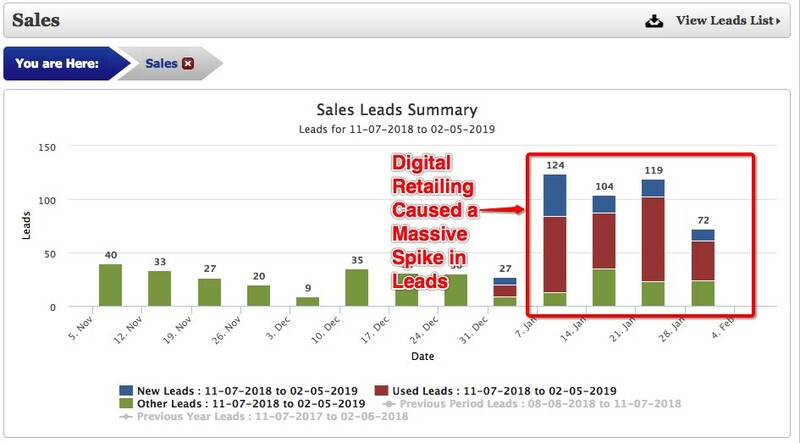 In fact we’ve seen our own dealers benefit from a massive increase in leads since we’ve placed our digital retailing tool on their site (as you can see in the chart below). Bottom line is that both consumers and the OEMs are going all in on digital retailing, and it’s time you started to do that for yourself. Otherwise, you’re going to be as relevant as Todd Gurley’s 35 rushing yards in the biggest game of his life (#sad). If you’d like to learn more about our award-winning digital retailing tool, SARA, fill-out the form below!